The theme of the conference was Hafatzat Hamaayanot, harnessing modern technology in the quest to spread Judaism to as broad an audience as possible. It was appropriate therefore that one of the first sessions was a video link up with the staff of Mayanot in Jerusalem who briefed the Shluchim about the programmes that they run and discussed how closer working relationships could be developed between the Yeshiva and UK Shluchim. Other workshops included one led by Rabbi Chaim Rapoport of Machon Mayim Chaim. Renowned for the quality of his shiurim, he shared his expertise in a session he led on Shiur preparation. Guidance as to effective use of Social Media was given by Daniel Saunders and Dayan Levi Yitzchok Raskin led a session on practical halocha relating to issues that might arise when running a Shabbaton. 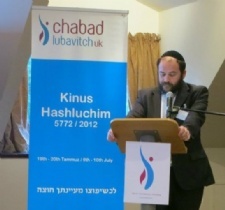 The conference also provided an opportunity for Chabad Lubavitch UK to launch their new branding which will be rolled out across the organisation in the coming year. The highlight of the Conference was the evening dinner where Rabbi Hershi Vogel of West London/Ealing shared anecdotes relating to his work as chaplain at Heathrow Airport. The Key Note Speaker was Rabbi Nissan Dovid Dubov of Wimbledon who delivered a moving and inspiring address. Following the Dinner the Shluchim continued with an informal Farbrengen led by Rabbi Elchonon Cohen of the Mayanot Institute of Jewish Studies. 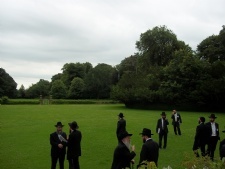 Having flown in specially from Jerusalem Rabbi Cohen created a vibrant and uplifting atmosphere that saw many Shluchim singing, dancing, talking and inspiring each other until the early hours of the morning. Rabbi Yehuda Pink, Chair of the Conference Committee thanked his colleagues on the organising committee for dedicating an enormous amount of time and energy to ensure that the Conference would be a success. He said that the feedback has been extremely positive and commented on the importance of the conference as a platform for learning and growth.